The skin with a surface area of around two square metres is the largest and simultaneously the most sensitive human organ. This makes proper skin care that much more important. Wearing a prosthesis can lead to skin problems such as chafing, perspiration and odour formation in addition to impairing the skin's protective function. With our DERMA series tailored to these special requirements, we are happy to provide thorough and gentle skin care. To clean the skin, prosthesis and liner, we offer you the ph-neutral, alkali and phosphate-free product Derma Clean for gentle, reliable cleaning with antibacterial hygiene power. 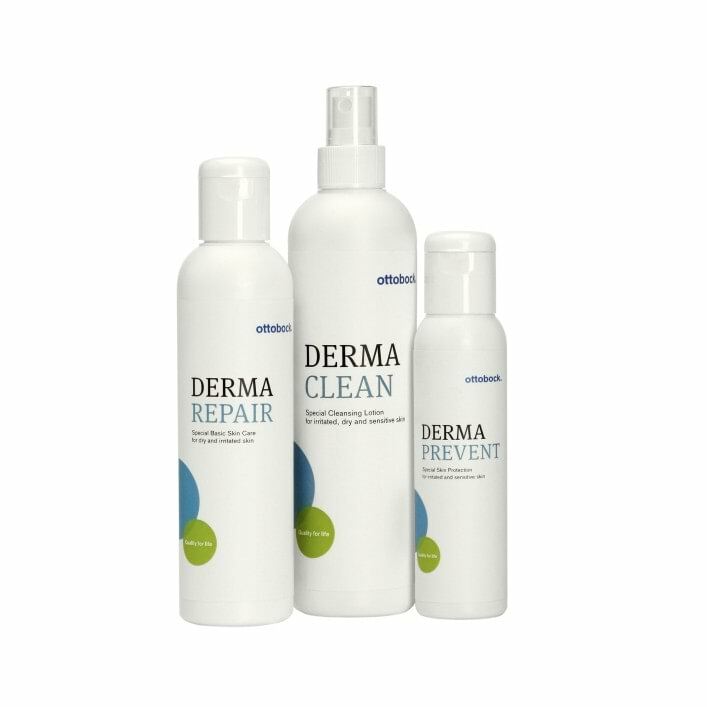 Derma Prevent is used for subsequent care and to prevent chafing, coating stressed skin with a protective film and preventing perspiration and odour formation. To regenerate areas of skin that have already been affected, we recommend Derma Repair which alleviates the consequences of high stress and guards the skin against damaging external influences. Enriched with panthenol and vitamin E, it regulates the skin's moisture balance, making it more pliant and elastic.